Although little is known about the details, the records show that the Shamrock’s won the Derry championship in 1939, which was a commendable achievement in view of their brief experience in the game. Members of that era – most of them still to the fore though perhaps not so supple and agile as then include: Joe Dillon, Paddy McGahey, Johnny Flannagan, Paddy Madden, Vincent Convery (Rory), Danny McAtamney, Jim McAtamney, Brian Flatley, Paddy O’Neill, Joe, Dan, Pat and Tom Boyle, J.P. Kearney, Dan McCrystal, Eddie Brennan, Patsy Brennan, John Joe Ward, Jim Dougan, Joe Hurley, Hugh A. McGurk, Harry Lagan, Jack Convery, Henry McErlean, Rev.C. McGoldrick and Joe Paul Dillon. The Shamrocks were fortunate to be able to call upon the services of a few southern players who were living in the area at that time. These included Master Holloway from Tipperary who taught in Ballymapeake primary school and who gave yeoman service to the club – both on and off the field. Timmy Ryan was another Tipperary man whose artistry shone like a beacon, while there was also John and Seamus Burke from Galway. Whilst contributing greatly to the playing strength of the Shamrock’s team, the skills of these ‘naturals’ no doubt wore off on the local players. 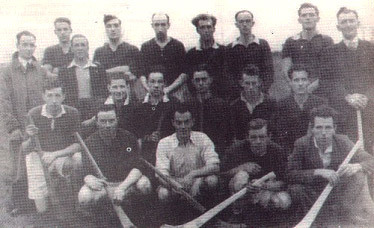 Due mainly to the lack of a home county league and the difficult conditions of the ‘hungry thirties’, the hurling team ceased to participate in competitions shortly after their 1939 Championship triumph. However the club still existed, though inactive, and in 1941 an amalgamation place between the hurling and football clubs. By this time Hurling had been resurrected somewhat within the county and enough teams now functioned to allow a league as well as the County Championship. In 1943 Lavey reached the final of the hurling championship only to be beaten by Mitchel’s of Coleraine. This defeat was particularly disappointing, as the club had already won the football championship that year – so a unique football – hurling double had been denied at the final hurdle. Back Row: L. to R. – Pat O’Connor, John Magill, Hugh A. McGurk, Joe Hurley, Dan Boyle, Tim Ryan, Henry H. McErlean, Jack Convery, Dan McCrystal. Front Row: L. to R. Johnny Flanagan, Jim McAtamney, Jim Bradley, Harry Lagan. Whilst 1943 was a very successful year, .44 will be remembered as one of the most triumphant distinguished history of the Erin’s Own club. The footballers retained their county title with a final victory over Mitchels (Derry) while the hurlers fulfilled their part of the bargain by completing that elusive double, with semi-final ‘revenge’ over Mitchel’s (Coleraine) and a win against Sarsfield’s (Derry) by 4-3 to 3-3 in the final. Incidentally the hurlers encountered a similar problem to the footballers of conveying their players to Derry City for that championship final meeting with Sarsfield’s. The total cost of the venture was in excess of £50 – a substantial sum of money in those days. Lavey made something of a habit of winning the hurling championship during the forties. In 1946 they accounted for Coleraine in the semi-finals and Kevin Barry’s (City) in the final. The records show that they won the title again in 1948.